My friend and I recently harvested a couple hundred apples and I decided to make applesauce to preserve most of my share. I found this awesome crock pot applesauce (no sugar added) recipe that I highly recommend. Turning apples into delicious applesauce was a piece of cake. Now what to do with my bounty of applesauce. Freeze some, eat some, use in pancake batter, and naturally add to my smoothies. It’s also blueberry season in Michigan and my freezer is jam-packed with organic blueberries. Blueberries, homemade applesauce, and a few other choice ingredients make for one delicious and highly nutritious smoothie. Here’s a quick rundown of the health benefits this smoothie imparts. Apples and blueberries are high in antioxidants, great for your cardiovascular system, help regulate blood sugar, support good eye health, and provide anti-cancer benefits. Blueberries, aka brain-berries, are also great for cognition. Apples have been shown to help those suffering from asthma. Both of these fruits contain an array of vitamins and minerals and offer additional health benefits, but those are the most recognized. As you can imagine apples and applesauce are interchangeable smoothie ingredients. 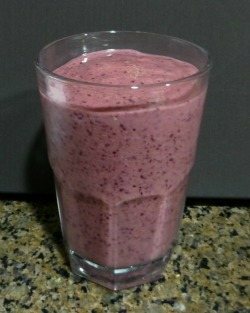 I hope you enjoy this smoothie! I’d love to know if you tried this blueberry applesauce smoothie – please do tell in the comments below. Happy Blending! Having spent the day yesterday making 70 pints of applesauce, I thought an applesauce smoothie for breakfast today would be ideal. I followed your recipe and added ¼ cup lemon yogurt, ¼ C coconut lime komcucha and a handful of goji berries. It was smooth and delicious! Thank you for the recipe!! Just got a Magic Bullet – can’t wait to try this applesauce and blueberry smoothie – will probably add chia seed/flaxmeal or hemp seeds – definitely a TBS Coconut oil! Have fun whipping up flavorful and nutritious smoothies with your new Magic Bullet, Sarah! This is a good smoothie. I added kale, yogurt,peanut butter, and chia seeds. I also used unsweetened almond milk for the liquid portion. Thank you for sharing! Thank you for sharing, Charlie! Your version of this smoothie sounds delicious.